Terrific Evidence That Accepted Martian Pressure Is Wrong (Updated 3/24/2017). "Mars either has more gusts of wind than we knew about before, or the winds are capable of transporting more sand," said Nathan Bridges, planetary scientist at the Johns Hopkins University's Applied Physics Laboratory in Laurel, Md., and lead author of a paper on the finding published online in the journal Geology. We used to think of the sand on Mars as relatively immobile, so these new observations are changing our whole perspective." ...Now, after years of monitoring the martian surface, the spacecraft has documented movements of a few yards or meters per year in dozens of locations across the planet. The first hints that Martian dunes move came from NASA's Mars Global Surveyor, which operated from 1997 to 2006. But the spacecraft's cameras lacked the resolution to definitively detect the changes. NASA's Mars Exploration Rovers also detected hints of shifting sand when they touched down on the red planet's surface in 2004. The mission team was surprised to see grains of sand dotting the rovers' solar panels. They also witnessed the rovers' track marks filling in with sand." It would seem obvious that winds can only be more capable of transporting sand if the air is denser than previously believed. Let's go back to the statement that, "Wind-tunnel experiments have shown that a patch of sand would take winds of about 80 mph to move on Mars compared with only 10 mph on Earth." How does this compare with winds observed on Mars? The first set of graphs below show how wind speed varied at Viking 1 between its sols 1 and 350 (with the exception of sols 116 to 133 because data was missing then). Each sol (Martian day) was divided into 25 time bins, with wind readings provided for each one. During sols 1 to 199 the maximum wind recorded was 16.4 meters per second (36.7 miles per hour). 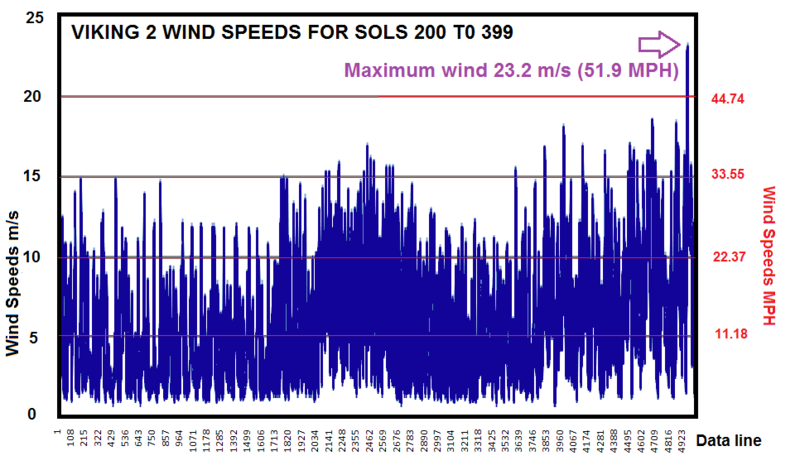 Between sols 200 and 350 there was one incident where winds reached 25.9 m/s (57.9 mph), but at no measured point over 8,331 measurements, did the wind ever reach 80 mph. Average winds for Viking 1 were about 2.75 m/s (6.12 mph) during sols 1 to 199, and 5.3 m/s (11.86 mph) during its sol 200 to 350. All wind data was obtained from the Viking Project Group headed by Professor James Tillman. For Viking 2 during sols 1 to 199 the maximum wind recorded was 9.9 m/s (22.1 mph). Between sols 200 and 399 it was a good bit windier, but the maximum winds were 23.2 m/s (51.9 mph) - still short of the 80 mph figure required to move the sands as was actually seen. Average winds for Viking 2 were about 3.37 m/s (7.54 mph) between sols 1 to 199. Average winds for Viking 2 were about 5.96 m/s (13.33 mph) between sols 200 to 399. ABOVE: Figures 1 and 2 show how winds varied at Viking 1 between its sols 1 and 350. ABOVE: Figure 3 shows how winds varied at Viking 2 between its sols 1 and 199. BELOW: Figure 4 shows how winds varied at Viking 2 between its sols 200 and 399. Our MarsCorrect Porrect PowerPoint presents data about how our earlier landers failed to correctly measure air pressure on Mars. At slide 23 we included the slide seen below. On it we refer to Occam’s Razor which states that (1) entities must not be multiplied beyond necessity and (2) the simplest solution is usually the correct one. Slide 23 was included before we developed the graphs about Martian winds above because even then it looked like the sand has moved around much more on Mars than it should for a planet that is only supposed to have an average air pressure of 6.1 mbar at areoid compared to 1,013.25 mbar on Earth. We included this slide at the Mars Society Convention in Dayton, Ohio in 2010, but it was left as a spare slide at my presentation at the convention in Dallas in 2011. I thought then that the topic needed more proof, but as was indicated above, that proof seems to have been released by JPL and NASA. There is also a film clip at Segment 3 of http://www.nasa.gov/mission_pages/MRO/main/index.html that shows dune Martian movement. More, there is new evidence of liquid water movement across the current Martian surface at http://www.nasa.gov/multimedia/videogallery/index.html?collection_id=14659&media_id=104892521. This section of our study will highlight some issues raised by the paper on Planet-wide sand motion on Mars by Nathan T. Bridges (et al., 2012) with comments by the Roffman MarsCorrect Group Comment. The full paper can be found at Geology, January 2012; v. 40; no. 1; p. 31–34; doi:10.1130/G32373. Its figures are at Data Repository item 2012011. In the Abstract: Prior to Mars Reconnaissance Orbiter data, images of Mars showed no direct evidence for dune and ripple motion. This was consistent with climate models and lander measurements indicating that winds of sufficient intensity to mobilize sand were rare in the low-density atmosphere. We show that many sand ripples and dunes across Mars exhibit movement of as much as a few meters per year, demonstrating that Martian sand migrates under current conditions in diverse areas of the planet. Most motion is probably driven by wind gusts that are not resolved in global circulation models. Dunes and ripples (collectively termed bedforms) are abundant and widespread on Mars, with concentrations surrounding the north polar layered deposits, within craters and other depressions that trap sediment, and as isolated patches on the plains. Roffman MarsCorrect Group Comment: The area surrounding the north polar layered deposits includes some of the lowest elevations on Mars (see the map below). Low elevation implies higher pressure, which means that it becomes easier for the winds to move bedforms. In the Introduction: "HiRISE, on the Mars Reconnaissance Orbiter (MRO), has a pixel scale as low as 25 cm, compared to the MOC minimum of 1.4 m, and shows fine-scale details on these sand features, including superposed secondary ripples on dunes not discernible at coarser spatial resolution." Roffman MarsCorrect Group Comment: So what we need to study (with on-going funds from NASA to do so) are HIRISE and rover photos. In the Introduction: ... "the presence of the Martian bedforms is at odds with surface meteorological measurements and climate models that indicate that winds capable of moving sand (termed threshold winds) are infrequent in the ~6 mbar atmosphere (Arvidson et al., 1983; Almeida et al., 2008)." Roffman MarsCorrect Group Comment: Everything that we have seen and written about in our Report is at odds with surface meteorological measurements. This is the point. The pressure sensors had their air intake tubes clogged at landing, rendering their measurements too low and just plain inaccurate. In the Introduction:: Similarly, fine-scale observations from the Mars Exploration Rovers (MER) showed evidence for saltation (Sullivan et al., 2008; Geissler et al., 2010; Golombek et al., 2010). Roffman MarsCorrect Group Comment: Saltation, or just plain sand blown in on the wind? In the Introduction: ..."analysis of multiple HiRISE images acquired over several Martian years that demonstrates that many regions contain moving bedforms." Roffman MarsCorrect Group Comment: Clearly we are not talking about a rarity on Mars. If our rovers can detect the sand movement it is likely that such movement may be the rule rather than the exception. In Methodology: "numerous field investigations show that the ratio of crest-to-crest spacing to height for terrestrial sand and granule ripples is ~10:1, with ranges of 5:1–27:1 (Sharp, 1963; Werner et al., 1986; Zimbelman, 2010), the width of barchans relative to height is 7:1–15:1 (Hesp and Hastings, 1998; Gay, 1999), and dome dunes have width to height ratios of ~10:1 (Catto and Bacchuber, 2000). Therefore, measured bedform spacing and widths were converted to height by multiplying by 10, the one exception being the height of dunes in Nili Patera, for which a DEM was available." 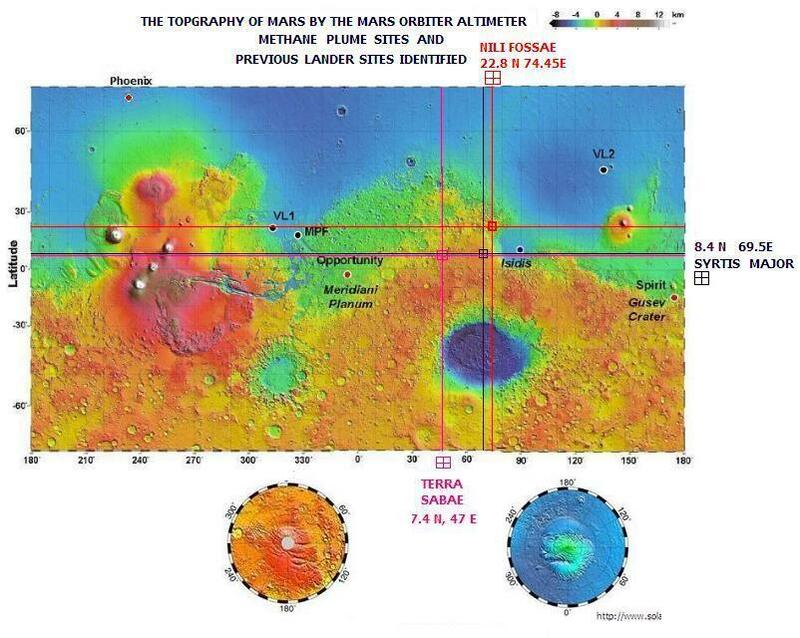 Roffman MarsCorrect Group Comment: Thus it appears that despite the differences in gravity and air density between the Earth and Mars, assumptions based on terrestrial geology are not out of line for Martian considerations. Martian dunes overlap with migration rates found on Earth. In contrast, the Mars ripple migration rates are about three orders of magnitude less than typical Earth values for bedforms of the same size and are equivalent to those of the dunes. Martian dunes with migration rates similar to some on Earth are unexpected, especially because some ripples migrate at rates comparable to those of the host dunes. If the Martian bedforms behaved like their terrestrial counterparts, and given the low frequency of threshold winds predicted by climate models, an inverse migration to height trend of similar slope, but offset downward of the terrestrial points, would be expected. Roffman MarsCorrect Group Comment: Dunes would seem to be easier to track than ripples, especially over time. If so, the Mars ripple migration rates above might be flawed. However the important part of the assumption (shown in bold print) is that there is a low frequency of threshold winds. If the pressure is higher than accepted (flawed) values, then the threshold winds are lower and the likewise flawed climate models are irrelevant. One possibility is that many Martian dunes are indurated (hardened) at depth, due to mineralogical cementation or, in high-latitude regions, ice cementation. If so, then the stoss (windward) and lee dune changes are actually reflective of the motion of a thin rippled skin over a harder interior, not that of the entire dune mass that would otherwise be expected to have a lower migration rate. The presence of ice in the subsurface only centimeters below the surface in polar regions is well supported by Gamma Ray Spectrometer data, seasonal thermal observations, and extensive theoretical studies (Mellon and Jakosky, 1993; Feldman et al., 2008). In addition, some polar dunes display what are interpreted as indurated features on their stoss slopes (Bourke, 2010). Roffman MarsCorrect Group Comment: Could this explain why the Mars ripple movement rates are so much lower than terrestrial values, while the dunes are moving along at terrestrial rates? Comparing the movement map to predictions of the Ames Global Circulation Model (GCM) (Haberle et al., 2003) shows no correlation to the high wind frequency regions (Fig. DR3). This demonstrates that the models do not resolve small-scale topographic, katabatic (as occur in the north polar region; Ewing et al., 2010), and general boundary layer turbulence that may cause gusts above threshold (Fenton and Michaels, 2010). Roffman MarsCorrect Group Comment: The GCMs are based on the assumption that the average pressure at Mars areoid is only 6.1 mbar. If the movement maps do not resemble the GCM predictions, then this again may support our contention that the ultralow pressure is incorrect. Under Comparisons to Global Circulation Models: ..."strong wind gusts not resolvable by GCMs are probably a major driver of sand motion. In polar regions not modeled by the GCM, katabatic winds may also greatly enhance local wind speeds (Ewing et al., 2010)." Roffman MarsCorrect Group Comment: Again, there were no gusts seen in the 8,331 measurements that we checked from Vikings 1 and 2 that met the 80 mph threshold cited earlier. On Earth katabatic winds carry high density air from a higher elevation down a slope under the force of gravity. They can rush down elevated slopes at hurricane speeds, but most are not that intense and many are on the order of 10 knots or less. But looking at the map shown above, it appears that the entire circumpolar area is well below areiod with no mountains until about 45 degrees North latitude is reached. It is not certain from looking at the map that enough topographic relief exists in the far north in a wide enough area to use katabatic winds explain the sand movement there, though they might come into play further south where the MERs were deployed. Under Discussion: Below the resolution of HiRISE as seen by the MER rovers, the evidence for motion of fine sand is compelling, with indications of sand blowing out of Victoria Crater that erases rover tracks (Geissler et al., 2010), craters superposed on the ripples being filled with sand (Golombek et al., 2010), secondary ripples from winds funneled along the troughs, and one observation of small sand ripple migration (Sullivan et al., 2008). Roffman MarsCorrect Group Comment: See Figure 7 below to view how fast Spirit MER tracks were filled in by sand during a storm in 2007. The Figure shows erasure of Spirit’s tracks during the 2007 global dust storm. Unfortunately, the Spirit carried no meteorological instruments. This means that it could not measure pressure or wind. However we can compare the time that it felt the dust storm to the time that Viking 1 experienced its two global dust storms in 1977. We could also look at what happened to Viking 2 then, but both MER Spirit and Viking 1 were in the Martian tropics while Viking 2 was at almost 48° North. As such, it is appropriate to examine the winds experience by Viking 1 during dust storm 1977a, which began at Ls ~205, and dust storm 1977b which started at ~Ls 275 (see Figure 8). We reviewed the hourly winds for 20 sols after each of these Ls positions in the Martian orbit, where Ls 0 = the start of spring (in the northern hemisphere where Viking 1 landed), Ls 90 = the start of summer, Ls 180 = the start of fall, and Ls 270 = the start of winter. In skimming through the data it appears that in the 20 sols that begin at Ls 205, the maximum wind at Viking 1 was 25.9 m/s (57.93 mph - see Figure 2 above), but this velocity did not occur until Ls 210.872. For the second dust storm the maximum wind was 18.3 m/s (40.9 mph). Note: For Global Dust Storm 1977a the first hourly wind for Viking 1, Ls (Solar Longitude) 205 was reached by coincidence its Sol 205. The initial hourly wind examined was at Ls 205.017 at Sol 205.38. Hourly winds were then tracked through it Sol 224.98. This occurred at Ls 217.301. For Global Dust Storm 1977b the first hourly wind examined for Viking 1 was at Ls 275.005 at its Sol 314.14. Hourly winds were then tracked through it Sol 333.98. This occurred at Ls 287.385. FIGURE 7: Erasure of Spirit�s tracks during the 2007 global dust storm between its 1250 and sol 1272. Credit: NASA/JPL, courtesy of Geissler, et al/JGU. FIGURE 8: Charts Modified from the Viking Computer Facility (Tillman et al.) showing how pressures varied with time at Vikings 1 and 2. Note the onset of global dust storms. The bottom chart shows two exception pressures for Sols 1160 1nd 1161. These were in MSL Year 2. Under Discussion: At obliquities greater than the present 25° to 50°, atmospheric density is predicted to increase due to release of CO2 from polar cap sublimation and regolith desorption, resulting in pressures of 10–15 mbar compared to the current ~6 mbar (Kieffer and Zent, 1992; Phillips et al., 2011)... Because the threshold friction speed is approximately inversely proportional to the square root of atmospheric density, such pressure increases will reduce threshold friction speeds by 30%-60%. Roffman MarsCorrect Group Comment: During Viking 1's sols 1 to 350 the maximum wind velocity recorded was 57.9 mph. For Viking 2 between its sols 1 to 399 its maximum wind was 51.9 mph. If the surface pressure is actually 10 to 15 mbar, and threshold speeds are reduced from 80 mph to 30% or 60% less, then these speeds become something between 56 mph (with a 30% reduction) and 24 mph (with a 60% reduction. The 24 mph speed is entirely consistent with velocities plotted on Figures 2, 3 and 4 above. The highest wind recorded for Viking 1 also exceeds the 56 mph requirement. Therefore, the winds seen at Vikings 1 and 2 are consistent with moving sand at pressures between at least 10 and 15 mbar. The 8,331 wind measurements are not at all consistent with 6.1 mbar. Under Discussion: "...these results show that winds in the present low-density atmosphere of Mars are sufficient to move dunes and ripples in many areas of the planet. A major climatic change with a thicker atmosphere is not required." Roffman MarsCorrect Group Comment: We think that the last sentence needs to be lengthened a bit. The full sentence should read, "A major climatic change with a thicker atmosphere is not required because the thicker atmosphere already exists now." From the August, 2012 landing of the Mars Science Laboratory until May, 2013, JPL via the REMS Team and Ashima Research published false information showing an absolutely constant wind of 2 m/s (7.2 km/hr) from the East. They knew they had a problem early on. In fact, Curiosity Deputy Project Scientist Ashwin Vasavada of NASA's Jet Propulsion Laboratory, Pasadena, California stated early on that "One possibility is that pebbles lofted during the landing hit the delicate circuit boards on one of the two REMS booms." He also said," We will have to be more clever about using the remaining wind sensor to get wind speed and direction." But they were neither clever enough to get the winds right at Gale Crater, nor honest enough to pull the erroneous daily reports until after we gave Guy Webster, their P.R. man, holy hell about it. During the argumentative phone call between Guy and me (Barry Roffman) he admitted that he knew they were publishing wrong data. I told him that because he was the man in charge of what got released to the public, and that what he was doing was wrong. He couldn't defend his position, and so, shortly after, as I demanded, he ensured that all wind reports for MSL were changed to Not Available. See Figure 44 in our Basic Report. To witness sand moving under MSL on 02.27.2017 click Sand Moving Under Curiosity, One Day to Next.